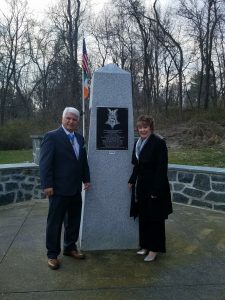 Medal of Honor Recipient Jim McCloughan and his wife Cherie recently visited the AOH Monument at the Medal of Honor Grove in Valley Forge Pennsylvania. Jim was recently awarded the Medal of Honor for distinguished actions as a combat medic assigned to Company C, 3rd Battalion, 21st Infantry Regiment, 196th Infantry Brigade, Americal Division, during the Vietnam War near Don Que, Vietnam, from May 13-15, 1969. The Medal of Honor Grove commemorates those who have earned our Nation’s highest award for valor. A section of the 52-acre grove is designated for each of the fifty states, Puerto Rico and District of Columbia. Jim McCloughan’s name will join those of his native Michigan later in the year. The AOH is also part of the Medal of Honor Grove story. After a lifetime of teaching Sister Marie Veronica of the Sister Servants of the Immaculate Heart of Mary had retired to Camilla Hall where she dedicated herself to researching the story of those awarded the Medal of Honor. Sister soon noted that there was a large number of immigrants, specifically from Ireland, who while awarded their adopted Nation’s highest honor never had the opportunity to become citizens or established residence in any state and whose story was omitted from the grove. Sister contacted the Hibernians, and through their efforts, a section of the grove was established to tell their story through the AOH obelisk. The seven feet seven-inch obelisk made of Wicklow granite and is centered on an octagonal plaza is located near the entrance to the Medal of Honor Grove overlooking a man-made pond. 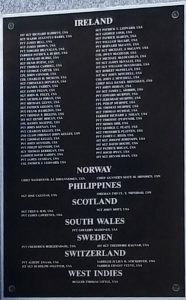 Engraved on the memorial are the names of those men from Ireland who are recipients of the medal and also the names of those men from Australia, Canada, Denmark, England, France, Norway, Philippines, Scotland, South Wales, Sweden, Switzerland, West Indies and the names of five men with a birthplace unknown. Former worthy National President Seamus Boyle has advised that next week 4/21/18 is the annual cleanup day for the entire Grove We expect over a hundred people and if any of Brothers are in the Valley Forge area, they are welcome to join them. We will be at the AOH site doing landscape work to finish the AOH memorial restoration project.